Discussion in 'Automotive News, Press Releases, and Events' started by Steve Stauning, Aug 1, 2018. Tamarra Armstrong, wife of the consummate Car Guy, Bryan, suffers from a very rare disease known as Superior Mesenteric Artery Syndrome (SMAS). Because this is a disease that affects fewer than 3 in every 1,000 people, the treatment options are limited; and all are very expensive. Tamarra Armstrong has been battling health issues for much of her life. She suffered from abdominal pain that was misdiagnosed for years and led to gall bladder surgery, a hysterectomy and a modified diet; and all of this by her early twenties. In 2012, a routine scan (after her first tachycardia heart attack while at work sent her to the ER) revealed she had superior mesenteric artery syndrome. A duodenojejunostomy was performed, and it was hoped she'd be able to resume a normal life. However, inappropriate sinus tachycardia (where the heart races inexplicably to 180-200 BPM with no cause or warning) led to more tests and medications. In the ensuing years, gastroparesis followed, and her body quit absorbing nutrients. She and Bryan made the journey to the Cleveland Clinic, a leading gastrointestinal research hospital, in hopes of a diagnosis that eluded Tamarra’s Utah doctors. Her stomach was deemed dead and a full gastrectomy was performed. For the next year she was able to maintain weight through the use of a surgically implanted feeding tube. Last year, her intestinal tract shut down as well, and she is now reliant on IV feeds through a port. Though the issues plaguing her gastrointestinal tract closely resemble Crohn's disease, those tests are negative. Tamarra and Bryan continue to hope for a diagnosis and even a cure, but the years of medical bills (the majority of which are not covered by insurance) has totally depleted the family’s funds. In 2006, Bryan and Tamarra began opening their home to foster children. Over the years, they’ve touched the lives of 23 children and successfully reunited 19 of those kids with their biological parents. Because Bryan works full time at a job that takes him out of the state every other week, the care and support of these children has fallen primarily on Tamarra's shoulders. Tamarra was driven to this crusade after she learned the heartbreaking details of many of those she’s helped. Details like never having their own bed or even just a space to call their own. She and Bryan have provided that to the foster children in their care; and the children leaving her home get to keep their bedroom set to help ease their transition. Bryan and Tamarra even adopted three of the foster children in their care. These children had suffered years of abuse; and, if not for the Armstrongs, they would very likely spend their entire childhood in foster care. Tamarra downplays her abilities and accomplishments, yet she silently works miracles on every life she touches, all while bearing her own burdens with solemn grace and quiet strength. “When you understand Tamarra’s journey and you learn about the lives she’s unselfishly touched, you immediately look for ways to help,” added Stauning. Assumptive Selling is Stauning’s newest book, and the first one written solely for the automotive industry. While it’s described as the complete guide for dealers, managers and salespeople to sell more cars for more money, it’s really more about providing a better customer buying experience in the dealership. The central theme of the book is that everyone is a buyer, and they’re going to buy today from you… if you can provide that experience. For vehicle salespeople and managers looking to gain an edge, Assumptive Selling gives them all the tools they need to succeed, while also reducing the time customers have to spend at the dealership. Of course, because the book is not cheap ($49.99 on Amazon), it’s not for everyone. 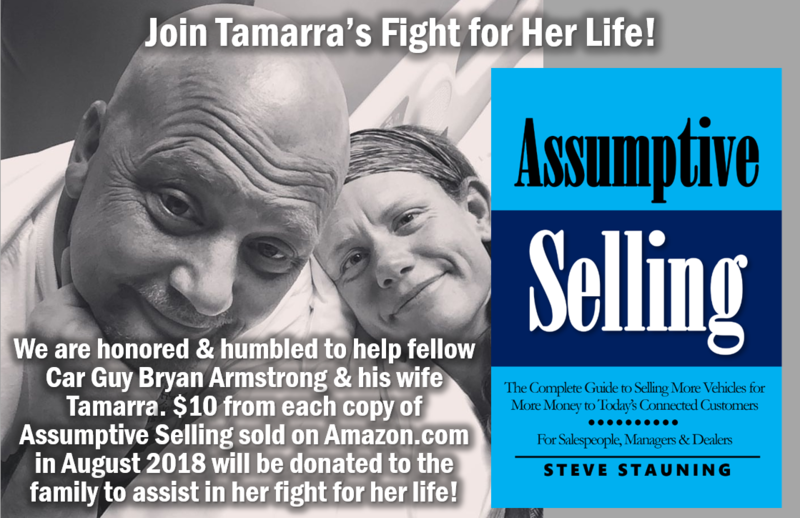 For those not in the car business – or not ready to shell out fifty bucks on a book – you can still help Tamarra in her fight against SMAS by donating directly on the GoFundMe page set up on her behalf. “I’d love to sell a bunch of $50 books, but I’d be happier if everyone reading Tamarra’s story donated $50 directly to the GoFundMe page,” Stauning shared. Assumptive Selling is available in paperback from Amazon.com. Have you recommended the book? Have you donated directly to help Tamarra? I'm honored to be a member of the #AutoFam, and I wrote Assumptive Selling to help dealers and salespeople sell more cars for more money. Have you recommended the book? Only 9 days left... Of course, you could also donate directly to help Tamarra - CLICK HERE!